What's really going on with this year's flu season? It's a "tough" flu season, flu experts say. Flu misery means jammed emergency rooms, a few closed schools and headlines about flu tragedies. At least four different strains of influenza are circulating now: Two influenza A viruses — H3N2 and H1N1, as well as two variants of influenza B. Getting one doesn’t protect you against a second infection so people could, in theory, catch flu four times in a given season. Current vaccines protect against both A strains and either one or both of the B strains. Vaccines that protect against three strains are called trivalent and those that protect against four are called quadrivalent. The flu season usually lasts for several months, and so at least six weeks and possibly more of flu season still remain ahead of us. It takes about two weeks for a flu vaccine’s protection to kick in, but that still leaves time for some benefits from vaccination. “It has been a tough flu season so far this year. 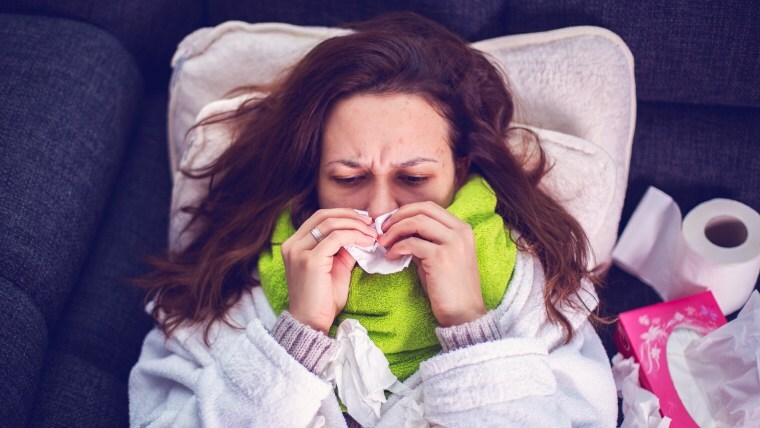 And while flu activity is beginning to go down in parts of the country, it remains high for most the U.S., with some areas still rising,” the CDC’s Dr. Dan Jernigan said. The U.S. is about halfway through flu season, based on past history, Jernigan said. Several groups are at especially high risk from flu: pregnant women, people over 65, people with asthma, diabetes patients, cancer patients, and people with heart disease. And it may surprise the 40 percent of Americans who are obese to learn that obese people have a higher risk of flu complications. You may be reading many headlines about the flu season, but it’s not a record year so far. Flu experts point out that the annual influenza epidemic hits every single year, but it also looks a little different each year. “We’ve experienced two notable characteristics of flu this season: The first is that flu activity became widespread within almost all states and jurisdictions at the same time,” Jernigan said. This year's flu season is about as severe as the 2014-2015 season, Jernigan says, and flu infections are about as widespread as they were during the 2009 H1N1 "swine flu" pandemic. While flu vaccines in general are not the most effective immunizations on the market, they do provide protection. One number going around is that the flu vaccine is only 10 percent effective. That statistic actually came from Australia’s flu season, and it referred to the vaccine’s efficacy against one of the strains — H3N2. In the U.S. the vaccines appear to provide about 30 percent protection against H3N2, the CDC says. While that isn’t great, it can keep people out of the hospital. And remember — flu vaccines are a cocktail of vaccines. They may protect better against the other strains of flu out there. “While we don’t yet have vaccine effectiveness estimates for this season, in previous seasons, vaccine effectiveness against H1N1 and B viruses has typically been in the 50 percent to 60 percent range,” Jernigan said. To find a flu vaccine, people can go to the CDC’s website or to vaccinefinder.org.